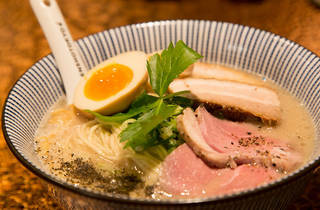 Tomoharu Shono, the 'ramen master' behind innovative shops such as Shinjuku's Menya Shono Gotsubo, opened this restaurant, noodle factory and 'ramen laboratory' right by Korakuen Station in August 2014. 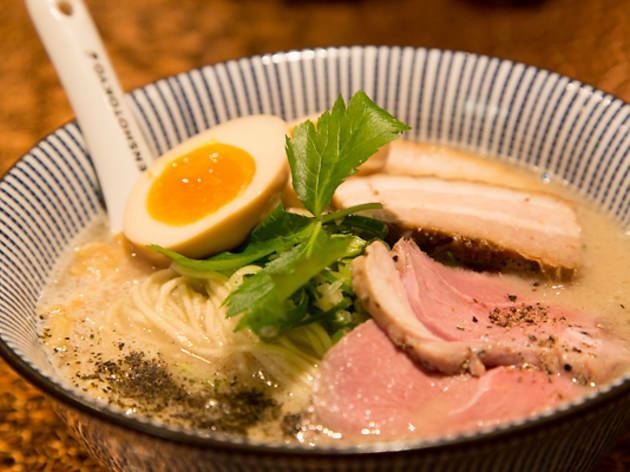 Boasting a stylish black-and-red interior, Mensho attempts to break onto the market with a soup that mixes tonkotsu and lamb, making for a rich, flavourful combination that leaves a delicately meaty aftertaste. The thin noodles, made in the in-house factory, are on the firm side and match nicely with the thick soup. Also, don't forget to tune up your soup with the ground pepper or the ginger-cardamom spray found at every table.